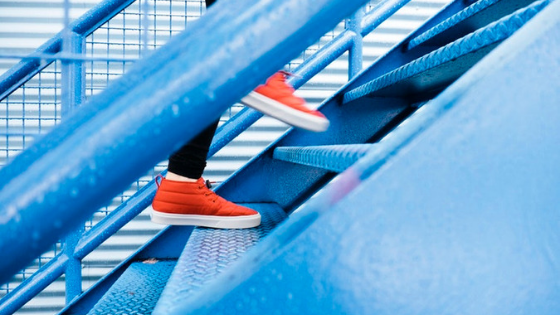 When you're a busy person, getting your steps in is either really easy because you're on your feet all the time or really hard because you're sitting in your office or car all day. If you're someone who can relate to the latter, 10,000 steps a day can seem like a mountain you have to climb every morning when you wake up. Rest assured, you're not alone. The residents of our Vallejo, CA apartments have mentioned the struggles they've had meeting their steps recently, so we came up with a few solutions that might work for you, too! Steps can add up quickly when you're doing little things like walking from your car to your office. If you park in the farthest space in your parking lot, you're giving yourself more steps by default. Of course, that's at least a round trip. If you leave for coffee or lunch, you're multiplying those steps several times over. Whether you work on the second floor or the 10th, stairs are a great way to get your heart rate up in a healthy way. Plus, who has time to wait for the elevator? Your brain can only take so much data, conference calls, and appointments on the calendar. Allow yourself to take a break. Walk around the parking lot for 15 minutes to clear your mind. You'll get the benefit of a few extra steps, and you'll have a more focused mind when you return to your desk. If you don't have your own dog, borrow a neighbor's. Chances are, there are plenty of pups who won't say no to a walk. You'll get the benefit of puppy love and a little random conversation with strangers while you get your steps in. If you have your own pooch, commit to walking an extra block every week. That'll change up the scenery and ensure you're both getting some much-needed exercise. Whether you want to get your steps in by living on the top floor of our apartment community or you'd rather take advantage of our fitness facility's treadmills and stationary bikes, Bay Village is here to help! Check out the amenities at our Vallejo, CA apartments today!